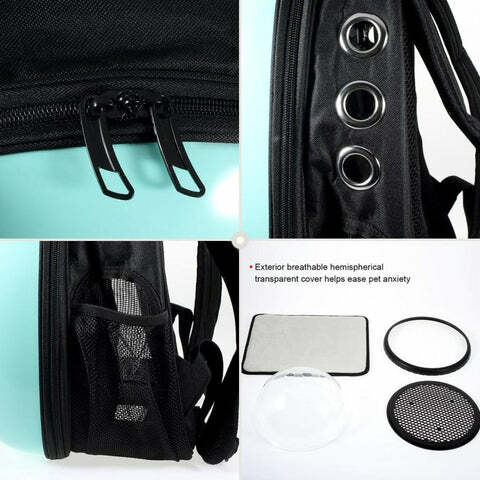 Bring your fur babies everywhere with this amazing space bubble backpack. Allow them a full view of the world in comfort and style! The secure hardshell case will protect them from the big world and the comfort pad bottom will ensure they travel in luxury. Three large air eyelets adorn each side, front, and the bubble itself, along with a large mesh breathable window on each side for plenty of fresh air and ventilation. Change out the space bubble for the included flat mesh cover when the bubble would otherwise be a hinderance. Sturdy zipper and stitching ensures your pets will always be secure on your back (or front)! Secure your pet's leash to the included interior D-ring leash clip for extra safety, ensuring your sneaky little devil can't escape when you unzip the backpack! Comes in a range of styles to match you and your pet's personality. Roomy interior with air holes on front and sides with extra durable mesh ventilation, all making it comfortable and breathable. Interchangeable bubble or mesh for front window. Check out our newest addition, the Large Window Pet Carrier Backpack, featuring a panoramic view for your furry companion!